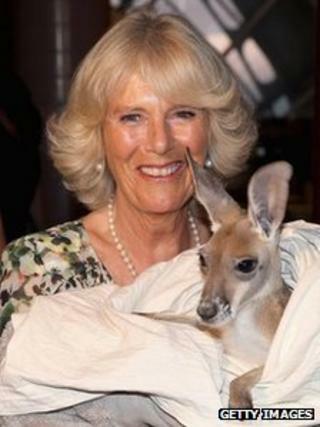 An orphaned kangaroo joey has charmed the Duchess of Cornwall as she and the Prince of Wales began a six-day tour of Australia to mark the Diamond Jubilee. The duchess met one-year-old Rooby Blue while she and the prince visited Longreach in Queensland. During a speech, Prince Charles admitted the jet lag had made him feel "a few sausages short of a barbie". They began their trip in Papua New Guinea and will also visit New Zealand to mark the Queen's 60-year reign. The young kangaroo was presented to the duchess during a visit to the Australian Stockman's Hall of Fame, a heritage centre chronicling the history of the outback "cattle men". She held the joey, which was wrapped in a cloth bag, for a short time, before passing her back to her temporary owner, Carley Walker. Mrs Walker explained that the joey's mother had been killed on the road and Rooby had been rescued from her pouch by a passing motorist. "Someone called me and I picked her up. We've had her since August and will have her a few months more, when she will be fully released," Mrs Walker said. The duke and duchess were also shown a display of whip cracking on horseback and inspected some bush artefacts during their visit, while the prince was presented with a stock whip. It is the first time the duchess has visited Australia. They were earlier welcomed to Queensland by the state premier Campbell Newman. After the tour the royal couple attended a barbeque in their honour, at which Prince Charles admitted to being a little tired. "It is more than 15,500km [9,360 miles] from London to the Stockman's Hall of Fame and I'm so jet-lagged that I feel a few sausages short of a barbie," he said. The prince went on to say he hoped the duchess would be able to sample some Australian cuisine during their stay. "I'm rather hoping that some of you might have been able to initiate [the duchess] into the special pleasure of Tim Tams, not to mention the unique experience of Vegemite, as our one and only jar of jubilee Marmite was confiscated on arrival here in Australia." The heir to the throne also spoke about his run-in with local creepy-crawlies when he lived in Australia in the 1960s. He studied at Timbertop school in Melbourne, Victoria. "For company I remember funnel-web spiders, bull ants, leeches that could only be removed with a cigarette end, snakes of every description and kangaroos that overtook us on cross-country runs through the bush."